The Story: It all started when my uncle suddenly got sick, and then died--all from something that "should" have been a minor illness and operation. He was the last family member to live in our Anderson homeplace in Nelson County, Virginia, and with his death, all of the "old ways" came to an end. The first song, Homeplace, was written as my uncle lay dying in the hospital. One of my aunts made the comment that the house--our homeplace--was confused and upset by his absence, as he'd been born there and had lived there all of his life, rarely being away for even more than a few days. The image of the house having emotions and "life" pulled at me, and as with most of these songs, "Homeplace" pretty well wrote itself. The Well was written the morning after my uncle's death. 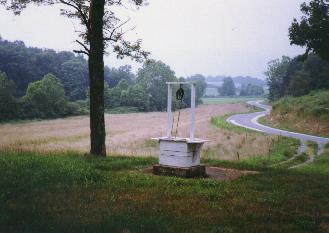 I felt a very strong compulsion to go paint the well at our homeplace, though I couldn't understand why. My children were very young then, but that morning--a Sunday--I went to a store, bought paint and brushes, and drove up to the empty house with my sons. The well in the front yard was still functional; in fact it was the only source of water, as my uncle had never put in indoor plumbing! While that's hard to imagine in this day and age, it just wasn't something that was important to him. Any time that we were at the "homeplace," part of the experience was to draw up a bucket of water and carry it into the house. As most of our visits were in the summer, this was a treat rather than an inconvenience. As we got to work that morning with our paint and brushes (my boys were going to "help"), my oldest, then 6 years old, asked where the water came from that was in the well. I answered, "There's a river underground, and the well sits there, above it." As soon as I said that, I began to "hear" a choir starting to sing a song. As chills swept over me, I went to my car, got some paper and a pen, and wrote down the words as I heard them. This is the song that I share with you now. The third song in this triology, More than a Memory, was written as I sat, all alone, on the front porch of our homeplace for the last time. The house and land had been sold out of the family, and I knew I would never go back again, "belonging," so I'd driven up for one last visit. It was such a beautiful late summer/early fall day, just slightly more than a year after my uncle's death, and I tried to absorb and hold in my heart all of the things that this place and my family meant to me. These experiences are what led me to an interest in genealogy, and researching my family's history has become my way of making sure that this place, these people, and these times always remain "more than a memory."